My goal for this site has been to gather as much information about Izannah Walker as I possibly can. I hope it will be a place where generous collectors will share pictures of their dolls (credited or not, whatever is comfortable). 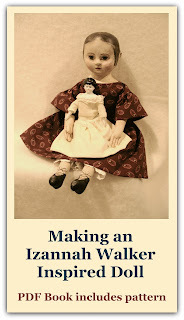 I also hope that others with knowledge about Izannah Walker and her dolls will share information to Chronicles readers. 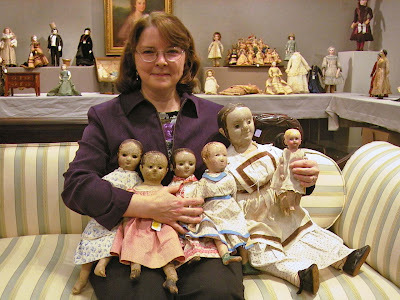 In that vein, I was happy to get a phone call from Monica Bessette, pictured above with Izannah Walker dolls auctioned from the Maurine Popp Collection. It was so wonderful to talk with someone who is passionately interested in Izannah Walker. 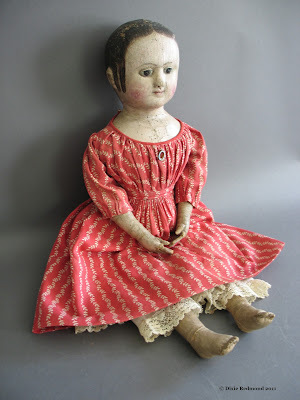 I'm hoping that I can persuade Monica and others (hint, hint) to offer more information about Izannah and to offer pictures of your original antique Izannah Walker dolls. It's for a good cause! Monica mentioned that the picture on the far left of the picture (the doll in blue) was known in the Walker family as "Izannah". This doll was originally in the Lila Singsen doll collection. It seems that when you're passionate about something, and another person's passionate about it as well, eventually paths cross. What a lovely informative blog, just found it! What a beautiful picture! It's not just seeing all the Izannahs, it's seeing her absolute joy in holding them! Thanks, Dixie! Such a wonderful group of lovely dolls!